Dogs need help sometimes. Whether they’re learning a new trick or finding themselves in a sticky situation from sheer curiosity, they can struggle. Most of the time as pet parents, we’ll be there to help our pups through whatever troubles they get into. And when we’re not around, it’s good to know that there are other dogs out there who are willing to help out their canine brothers, sisters, and friends. Here are six dogs helping other dogs out. In this short, 30-second clip, a dog struggles to get out of the pool. He goes back and forth against the edge, trying to figure out how to escape. Meanwhile, his big brother paces back and forth above him, clearly concerned for his best buddy. At first, big brother tries to pull him out by attempting to grab at the back of his neck. However, he can’t get a good grip as the pup in the pool cannot stay still. So big brother immediately jumps in and gives his sibling a boost up so he can climb out himself. It’s a truly a testament of devotion from one dog to another. Rufus, a Boerboel, is the eldest of the two dogs and knows his commands very well. Meanwhile, his younger brother, Jet, is still learning a thing or two. It’s a funny clip as their mom holds treats trying to teach the pup. While mom tries to get Jet to sit, Rufus senses his little brother might need some help learning his commands. Rufus places a paw on Jet’s back to help him sit down. This assistance amazes both pet parents, so they try it again. Jet still doesn’t understand the command, and Rufus comes through once more for his brother by putting his paw on Jet, so he sits. It’s treats all around for a job well done. Rufus’s helping paws benefit both pups! Looking down the stairs when you were a kid might have seemed daunting. Imagine being a months-old Golden Retriever who’s never gone down the stairs before. In this clip we see a young pup trying to find a way down. Her bigger brother tries to help out, but the task seems too intimidating at first. He tries to show her that going down the stairs isn’t all that bad, but she’s still not too keen on trying it. After a few more demonstrations by big brother, she finally makes her way down the stairs all on her own! If you’ve ever lived someplace where snow is a normal occurrence, you know a daily walk with your pup can be hard in winter. Take this mom and her two dogs who are out for a walk, for example. During a stroll in the cold, one of her pups took his own route and found himself unable to push through the snow. Mom calls for him to come but the snow is simply too much for him to fight through. His German Shepherd brother stands by until he looks back at mom for the “okay” to help out. Then, the pup quickly forges through the snow and creates a path for his brother. 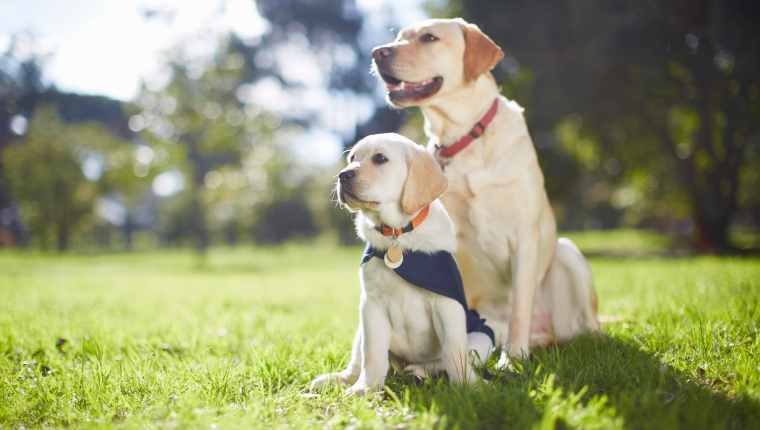 We’ve heard stories before of guide dogs or seeing-eye dogs who help visually-impaired or blind humans. But even dogs who have lost their sight need help, too. In this news clip, Charlie is an 11-year-old dog who lost both his eyes to glaucoma. He was depressed for a time until his pet parents decided to bring home a little brother for him. Enter Maverick, a four-month-old puppy who has helped brighten Charlie’s life. Not only does he keep Charlie company, but he assists him with walks and play time as seen in the clip. What a great and supportive baby brother! Sometimes, just knowing that our dogs are there for each other is all we need. In this very short clip, we watch a pet parent playfully tease his pup with his treat. The pup’s dad does this a couple times until we see a paw stop the madness. That paw belongs to the pooch’s doggy brother, who scoops up the treat and places it in his younger brother’s bowl. Way to look out for your bro! What do you think of these dogs helping other dogs? Does your pooch help out other pups in need? Let us know in the comments below!